Full home survey, professional installation, up to 10 years warranty, five star backup. Enjoy the benefits of softened water and eliminate limescale when you purchase a domestic water softener. By installing a water softener, you can get rid of the limescale build-up in your appliances, which means no more tough descaling chemicals in your kettle, in your shower or on your taps. Additionally, you can reap the benefits of better skin, soft, silky hair and brighter clothing with your own domestic water softening system. All softeners sold are specifically designed for the hard water conditions in the UK. 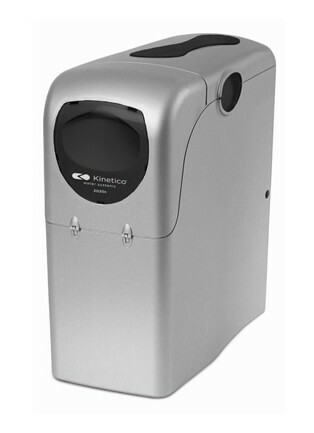 A Kinetico 2020c is the top of the range non electric water softener with an innovative, sleek and compact design, the 2020c water softener oozes style. Providing soft water to the whole house 24 hours a day. Once you've got used to a life with soft water, you'll wonder how and why you ever managed without it. Kinetico has a range of water softener solutions to suit all types of requirement. WE Softeners is an authorised dealer and will guide and assist you in selecting the most-suitable option for your needs.